Citation Information: J Clin Invest. 2014;124(2):473-475. https://doi.org/10.1172/JCI70336. As a young medical resident, I encountered a patient suffering from spontaneous coronary vasospasm and was puzzled by these dramatic alterations in vasomotion. This encounter piqued my interest in understanding the drivers of vascular reactivity. In a paper published in the JCI, my colleagues and I revealed a role for superoxide production in the vascular dysfunction associated with hypercholesterolemia. Subsequent work by our group and others has unveiled complex associations between ROS generation and vascular disease. 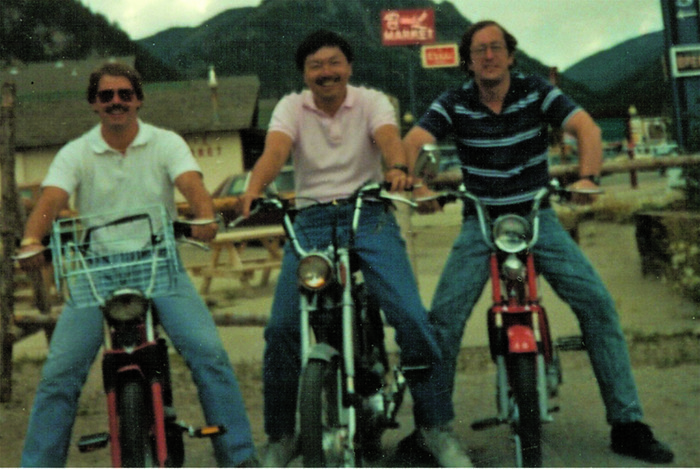 David Harrison (left), David Ku (center), and James Bates (right) at a Keystone Conference, circa 1990.